PAUL McCARTNEY & The STRAWBERRY JACKET. 'Melody Maker' April 28th. 1973. 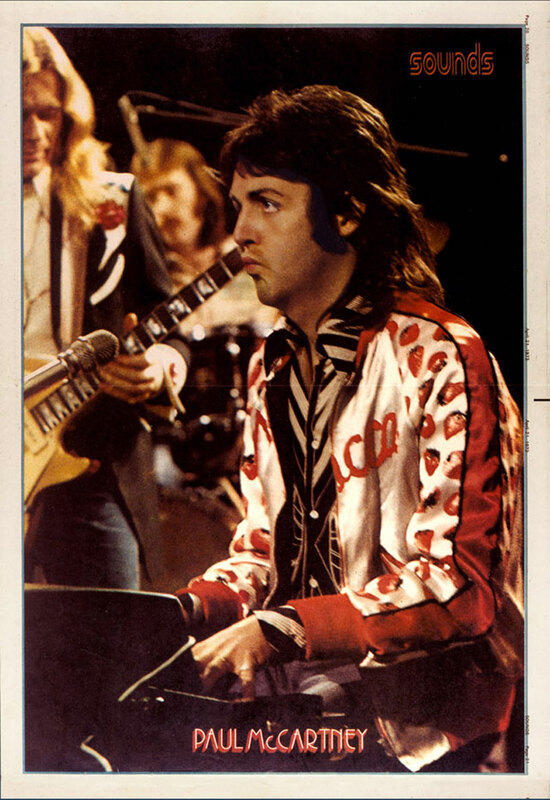 In 1973 Paul McCartney contacted us for some Strawberry jackets for his first US Wings tour. 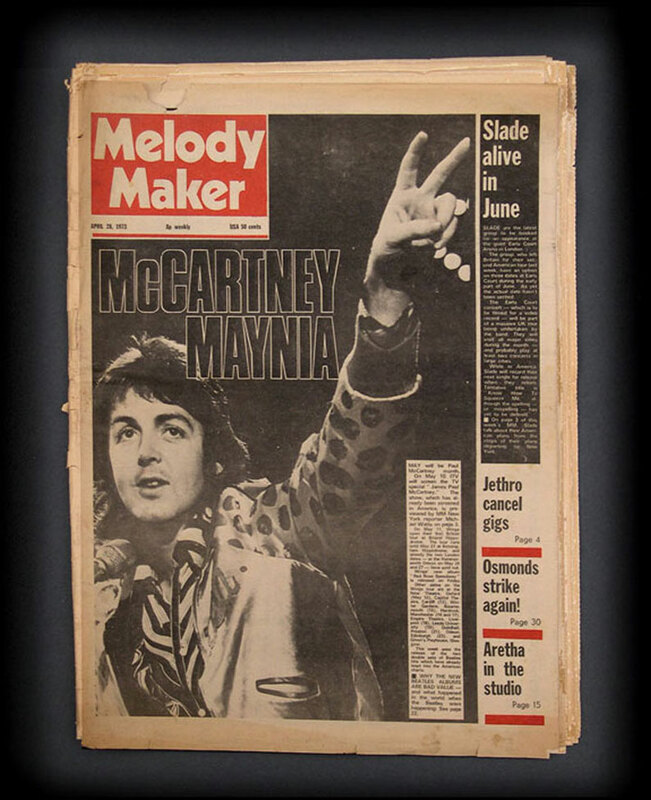 ‘Sounds’, the leading music paper of the time printed its centre pages as a wall poster of Paul wearing the jacket. At the same time, all the music press photographed him in every which way possible and along with Paul the jackets popularity soured popularity soured - it soon became known as ‘The Strawberry Fields Jacket’. Now the number of jackets we could sell seemed to be limited only by how many we could produce. Paul ordered six jackets and he became a collector of our work. 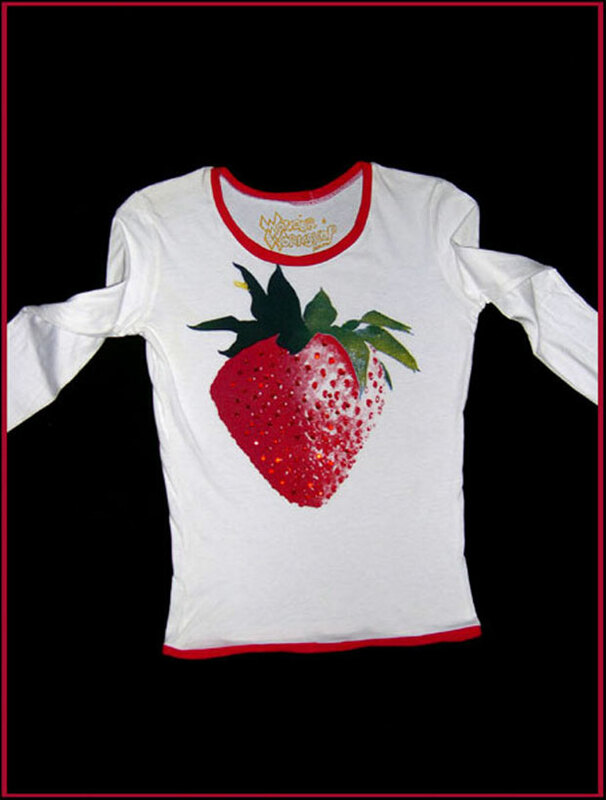 Since then, there’s been quite a few tributes to the Strawberry Jacket image but the most memorable was by Paul’s daughter Stella McCartney when she produced her Strawberry T-shirts for Chloe’ - she told us she loved the jacket and as a child she would sneak into Dad’s wardrobe and wear it. PAUL McCARTNEY & THE STRAWBERRY JACKET. 'Sounds' April 21st. 1973. 1973. The 'Strawberry Fields Jacket' was with Paul throughout the American tour and remained with him for his appearance on Top of the Pops the same year. John Lennon had written the song independently of Paul. Paul may have appropriated the Strawberry Fields Jacket image but he was very giving about John in his biography, "I've seen Strawberry Fields described as dull grimy but John imagined it to be a beautiful place. In summer, it wasn't dull and grimy at all, it was a secret garden. John's memory of it wasn't to do with the fact that it was a Salvation Army home, there was a wall you could bunk over and it was a rather wild garden - It was a hideaway for him where he could maybe have a smoke, live in his dreams a little - it was an escape for John". Molly led our Wonder Workshop Jacket making team with Carol Walsh and Pam Keats - Pam was a hopeless fan of Paul McCartney so when she was chosen to deliver Paul's Tour Jackets we knew it would be more than a casual meeting. Pam was gone for days - she came back to applique some 'Macca' signatures on the fronts of the Jackets then never returned. She became Paul & Linda's eternal Personal Assistant - designing and making their costumes and looking after their personal needs. Pam was a wonderfully stylish and generous woman who had just lost her very shortsighted boyfriend, so it was the perfect time for her to step into a new world where she would find complete appreciation of her talents and meet a new man - Wings guitarist Jimmy McCulloch. We conceived the The Strawberry Cut 'n' Sew kit in 1968 as a 'Multiple' artwork that ran alongside food sculpture multiples of green jellies and pink blancmanges. It was a huge project with 6 designs and over 40 silk-screens that developed over the following 3 years while other ideas overlapped. The Cut 'n' Sew images were the Strawberry and the Baked Beans then tributes to Marilyn Monroe, Elvis Presley, Jayne Mansfield, Jackson Pollock and the Silver Surfer (a Marvel comic hero created by Jack Kirby). By the time we completed the series we were probably into 1971. We purchased the Strawberries from Fortnum and Mason - the only store at that time where you could buy fresh Strawberries in January. They were African, slightly darker than our English varieties with very pronounced pips. We met up with our friend, ace photographer, John Claridge at his London Wall studio - Strawberries in hand. John is famous for his great photographs of London’s East End from the 50’s and 60’s - a master of black and white photography. John would always shoot the classic Claridge photograph giving the images incredible strength. The photographs turned out to be very surreal and dark - monochrome masterpieces. Colette Neville Pret-a-porter of Paris were producers of tough looking street clothes distributed to all the most Avant-garde boutiques in Europe. They gave us a continuous T-shirt and satin jackets order which ran for over 2 years. Fiorucci had a windo decked out with our strawberries and Camomilla in Rome too, so we had already established the Strawberry when the Jacket had suddenly merged into Beatle iconography. Later in 1971, the Sunday Times wrote an article about our Mr Freedom sculptures and learnt about the kits. We were encouraged to design a practical brochure on how to make the Jacket so it could be sold in the Colour Supplement as a Sunday Times Special offer. Everything was going well so a few months later we signed a contract for 800 Strawberry jacket kits and a few thousand of four other Cut’n’Sew designs. In the early 70’s we had no collateral so it became difficult to raise the money to make the kits. 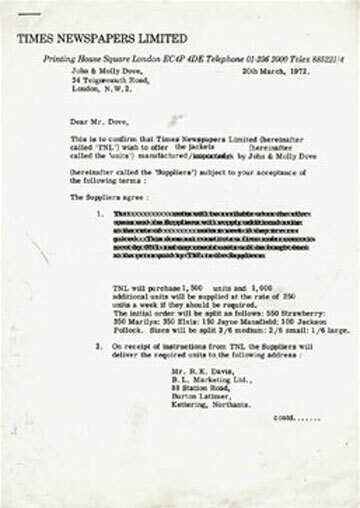 Then we couldn’t find a print company that could handle the technicalities or produce the quantities the Sunday Times had ordered. We were already working overtime producing our black Rock'n'Roll T-shirts with a store in Kings Road called Paradise Garage, so we had no time to promote the kits. We dropped the Sunday Times contract, changed the screens and imported a wonderful cotton satin from Switzerland so we could perfect the quality of the jacket. We also began to make t-shirts from the same screens with the patterns from our Elvis T-shirts from the year before.We had to expand the workshops a little to accommodate the new Jacket sewing team. It was a better arrangement - we produced the Jackets and T-shirts at our own pace and moved into developing new print ideas at the same time. In 1972 The Kings Road store, "Granny Takes A Trip" and “Ians” in Greenwich Village NY had begun to sell the Jackets in satin. The USA branches of Granny’s in New York, LA and Dallas also stocked the jackets and by 1974 the Hollywood store "Vibrations" in Century City supplied the heart of Tinseltown. We made a delivery ourselves and flew with Eagle Airways to LA via New England. It was a budget airline with very sparse seating arrangements and with Pilots that were the ‘true grit’ of the American Flyers of the Fifties. As we approached the Sierra mountains on the edges of LA, the pilot gasped over the intercom “you are about to witness the most magnificent view of LA I’ve ever seen in my entire flying career”..... the aircraft climbed out of the shadow of the mountains, turned, and gave us a panoramic view of Los Angeles ...... the lights of LA strewn across the vista like a treasure trove of diamonds and gems sparkling against a backdrop of a John Ford sunset. The event was too much for the pilot and he managed the roughest landing of his flying career - the steward remarked over the intercom “thank you ladies and gentlemen,we hope you have had a pleasant flight - we have just collided with LA”. We were stopped in customs with the overload of Satin Jackets and asked if they were for trade but we insisted they were costumes for The Rocky Horror Picture Show about to open at the Roxy theatre in West Hollywood - we made it. Colette Neville Pret-a-porter of Paris were producers of tough looking glamorous street clothes distributed to all the most Avante- garde boutiques in Europe. They gave us a continuous T-shirt and satin jackets order which ran for over 2 years. Fiorucci had a window decked out with our strawberries and Camomilla in Rome too, so we had already established the Strawberry when the Jacket had suddenly merged into Beatle iconography. The 1974 ‘Fabric of Pop’ exhibition at The Victoria & Albert Museum brought a different kind of interest to the Jacket. We produced a special piece for the exhibition showing the image as a continuous half-drop repeat pattern with all the Strawberry images fully studded with deep red rhinestones. 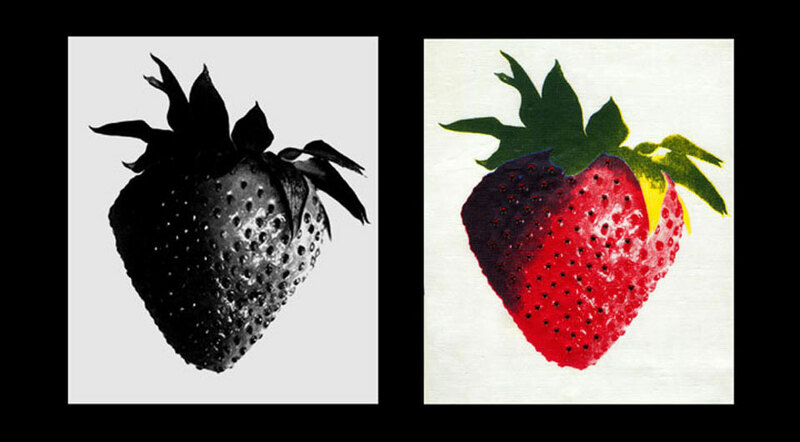 Michael Regan, the curator of the show, was reported by Arts Review and other leading newspapers to have selected the Strawberry print as his favourite piece. Our last satin Strawberry Jacket was stolen just before it was due to be shown again at the V&A in 1985. Later when the exhibition toured the UK, Molly and I were interviewed by the BBC at the Norwich Castle Museum to talk about the show. There was a wonderful cross-section of Textiles from here and from the USA, some dating back to the 50’s. We enthused generally about the significance of PopArt being drawn from the commercial images of a more product driven society, an artform primarily American and often inspired by Pop Music iconography. Suddenly the interviewer asked “what about the future?” - we couldn’y say - we realised we were completely involved with the present and our work is a celebration of that. So in our jacket’s short history the global culture has proclaimed the Strawberry Jacket to be a celebration of the Beatles’ "Strawberry Fields Forever". We loved the song - it’s one of the Beatles greatest, and perhaps we were inspired by it in some way but when we first conceived the design in 1968 we had made no reference to it, we were simply interested in the beauty of the Strawberry. However, the Stawberry Field story is a legendary tale so we’re fortunate to be a small part of it. In Liverpool, the two hand-painted signs that appear on each side of the entrance with it’s Strawberry red gates, have been festoned with loving messages from Beatles fans since the song became a worldwide hit in 1967. In 2004 the Strawberry Field gates had been stolen and later recovered. Recently the gates were replaced with replicas by the owners of the Strawberry Field children’s home and the original 100 year old gates put into storage. The Strawberry Field graffiti is cleaned off from time to time but it doesn't take long to return to it’s former glory. 1963 "She Loves You" / "I'll Get You"
1964 "Can't Buy Me Love" / "You Can't Do That"
1965 "Ticket to Ride" / "Yes It Is"
1965 "Help!" / "I'm Down"
1966 "Paperback Writer" / "Rain"
1967 "Strawberry Fields Forever" / "Penny Lane"
1967 "All You Need Is Love" / "Baby, You're a Rich Man"
1968 "Revolution" / "Hey Jude"
1969 "Get Back" / "Don't Let Me Down"
1976 "Yesterday" / "I Should Have Known Better"
Today, the Strawberry Jacket remains one of our most durable images. Recently a picture from ‘Look’ magazine showed Kasabian whipping up a storm on the Pyramid stage at Glastonbury where lead singer Tom Meighan was wearing the Strawberry. He said it was memorable: "I remember the sun going down, I was wearing a strawberry jacket and my long hair was blowing in the wind, and all these flowers were everywhere. It was wonderful."